The Frederator Studios Blog: ChalkZone's done it again! Right on the heels of their prestigious Annecy nomination, for the best TV series of 2005, comes the news that CZ's been honored by the distinquished Imagen Foundation, for their postive portrayal of hispanics. Created by The Imagen Foundation, the Imagen Awards competition has brought out the best and most talented portrayal of Latinos in television and film since 1985. ChalkZone was nominated along with two other of our sister Nickelodeon series -- Dora the Explorer and Nick News with Linda Ellerbee -- along with PBS' Maya & Miguel, and the WB's ¡Mucha Lucha! Everyone at Frederator has always been proud to be associated with the great work that goes into ChalkZone. And we want to congratulate the whole team on this episode: EP/creators: Bill Burnett & Larry Huber, Producer: Debby Hindman, Director: John Kimball, and Writer: Ford Riley. 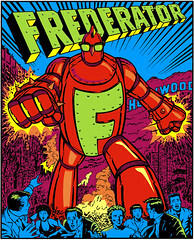 Chalk-up another success to Frederator! congrats! you're the greatest dave. thanks.